How to get the most out your fitness instructor to meet your goals. Looking to adopt a healthier lifestyle? Improve your fitness? Maybe your workout regime just needs a little shake up. Whatever your goal, it can be tough to accomplish it on your own. Real life has a tendency to get in the way of good intentions and sometimes we need a little help to stay on track. Working with a personal trainer can be a great way to keep motivated and accountable for your fitness and lifestyle goals. Make sure your personal trainer is right for you. Just like dating, it may take a few tries to find Mr. or Ms. Right. If you’re looking to join a new gym, take the time to do your research and learn about the available trainers. There’s no harm in setting up a few meetings with different trainers to get a sense of their personality and fitness methods. Some trainers are no-nonsense drill sergeants, while others offer a high-energy session or are more holistic in their approach. No method is necessarily best. It all depends on what you respond to and your own personal goals. I believe in a holistic approach. Of the 168 hours in a week, just a few are spent with your trainer. What’s more, fitness is only one element of improving your overall health and wellbeing. A holistically-minded personal trainer will give you tips and tricks to take outside the gym, including tips for achieving a healthy, balanced diet. For example, I recommend a diet of primarily whole and unprocessed foods—both before and after a workout. This is a straightforward approach that takes the focus off calorie counting, elimination diets and other “magic bullets” to health. What do you want to accomplish from your personal training sessions? What will make it worthwhile for you to continue to see your trainer week in and week out? Before your first session, it’s important to take the time to think about the goals you want to work towards. I love it when my clients show up for their first session with an idea of what they want to achieve. It shows they’re hungry for results and ready to start the work. I like to encourage my clients to set SMART goals—those that are Specific, Measurable, Attainable, Realistic and Time-based. The more well-defined and realistic your goals, the greater your chances of success. For example, because the average Canadian gets less than 17% of their energy from protein, which is at the lower end of the recommended range of 10% to 35%, it makes sense to set a goal to incorporate more nutrient-dense protein into your weekly meal plan. It’s important to remember that while you build up strength and endurance with each session, you’re also building a relationship with your personal trainer. Don’t be shy to communicate if your goals change. Your personal trainer is just that—personal. They want to help you achieve your goals and create a plan that works well for you. Being open about what you want to achieve allows your trainer to help you get there. 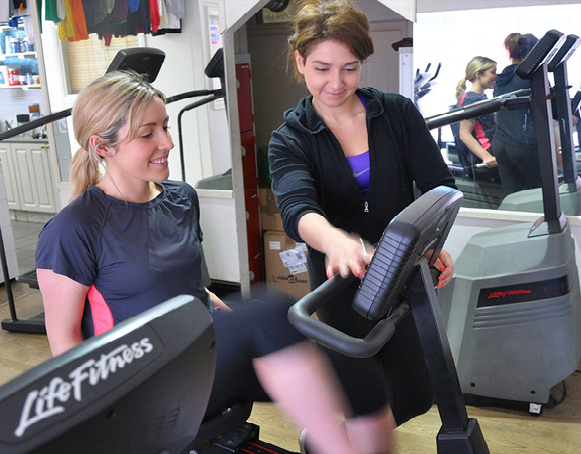 Work with your trainer to book regular workout times that will realistically work with your schedule. Book these sessions at least a month at a time to help you establish a routine. Consistent routines are a critical part of getting the most out of your training. This may be a fluid process, testing out days and times of the week that work best for you, and that’s okay. The key is that you find what works best. Planning can reach outside the gym. Have go-to recipes to keep your energy high, your metabolism strong and give your body and mind the nutrients they need to perform. One of my favourite recipes for a quick lunch or post-workout snack is grab-and-go tortillas (see recipe below). I use leftover beef from my family’s oven roast dinner to make these simple and delicious wraps. I’m a big fan of the cook-once, eat-twice (or more) method and encourage my clients to plan ahead in the gym and in the kitchen for optimal results. The right personal trainer for you is out there. When you take the time to set up an interview, define and communicate your goals and put a plan in place, you are setting yourself up for success. Believe it or not, roast beef is the perfect start to a speedy meal like this one. Use a small beef oven roast (try a quick roast such as top sirloin, sirloin tip or inside round) or use a grilling steak. To marinate onion: Heat a vinaigrette dressing to simmering and toss with onion slices to coat; refrigerate in dressing. Carve cooked roast into thin slices, cutting it across the grain. 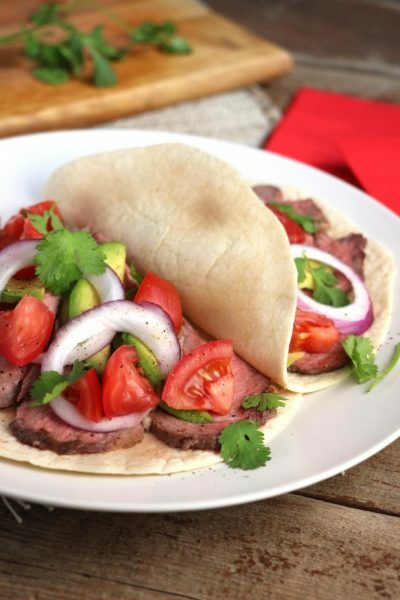 Assemble tortillas by layering sliced roast beef on warmed tortilla along with avocado slices, marinated onion and chopped tomato. Top with cilantro leaves (optional). 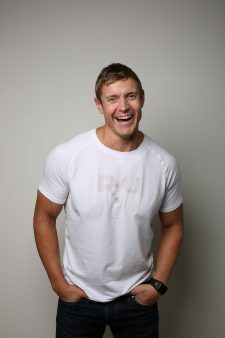 Dai Manuel, also known as “Coach Moose,” is a lifestyle mentor and executive performance coach. Dai is also a dad, dating his wife, a founding partner of Fitness Town Inc., speaker, award-winning blogger, podcaster, CrossFit athlete and coach, co-founder of the #YVRDads support group, a BC Children’s Hospital Grind for Kids Ambassador and author of the Whole Life Fitness Manifesto.